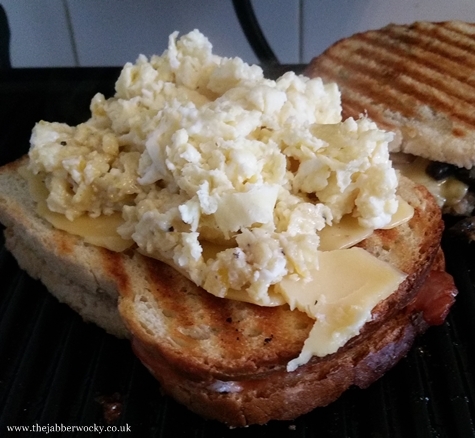 Technically anything containing egg falls into the breakfast toastie remit. In that sense, following directly on from yesterday’s Scotch Egg Toastie with the Full Monty is a bit samey. But that’s in title only. This one has been a long time in the making, like all good triple deckers. Partly because we strive for excellence. Mostly because it’s hard to eat more than one in a single meal. Fans of the triple deckers will hopefully approve of this one. Fans of a smaller breakfast will probably want to check here for a previous investigation into breakfast toasties. Ingredients listed top to bottom by toastie. 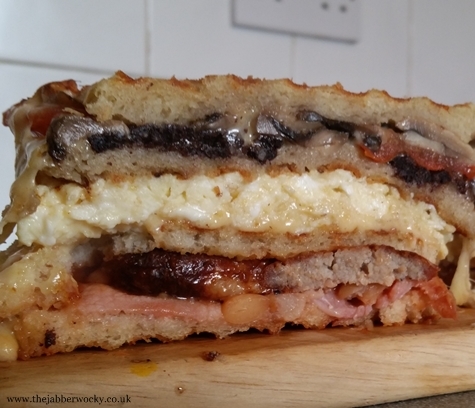 As toasties go, this one does need an entire breakfast cooking before you can start making your toastie. Rated long. 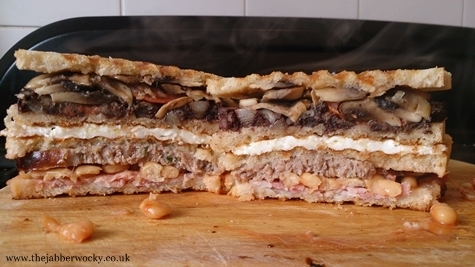 They weigh in at slightly more than a Manwich, and decidedly more filling than a normal breakfast. That said, they were spectacular, losing none of the full English pleasure, and adding all the delights of portability. Nailed it.